Rated 5 out of 5 by PJs_Buckaroos from Love these games If you love the Delicious Emily games you will enjoy this game as well...these are my favorite to play! Rated 5 out of 5 by kim0530 from A great game I have to agree that level one was a little bit boring until you get to the higher levels. It was a lot more challenging. What helped me with this game, I got organized. There's also a mini game and was having some problems (I think due to my laptop).. But it has a good story line and I did cry that the kitten died. I guess I'm a animal lover and always wished to become a vet. But I do have to be honest to say that this game maybe good for some and not for others. At least, give it a try beyond level one. Rated 5 out of 5 by lininindy from OUT OF THE KITCHEN INTO THE VET OFFICE!!!! COOL NEW TIME MGMT GAME... That's right up there with the newest tm games. FULL SIZE PLAY AREAS, great graphics, Take care of Pets, sell pet products, clip nails, pull debride from paws, x-ray, operate, I'm exited!!!!! Rated 5 out of 5 by Rooobeee from Another excellent time management game FULL DISCLOSURE: My review is based on the mobile game play, which is the same as the PC version. This game is by the same creators of the Delicious Emily games. And to prove that, you will see Emily for a minute at the beginning and at the end. However, this story is solely based on Amy Cares, a young veterinary graduate. Amy loves animals, but is having a difficult time trying to figure out where she wants to work. I tried out this game just to see what it was all about, and I was hooked on it. I loved the story line. The main story evolves around Amy and her difficult choice as to where to work. Her grandfather is closing up his clinic in Snuggford because he's retiring, and her best friend wants her to work in New York, where there are lots of opportunities. We first meet Amy in Snuggford, and then later follow her to New York. She doesn't make an initial good impression on her boss and supervisor, but she does get the job done. And while in New York, she also becomes entangled in a very complicated love life. The mechanics of the game are the same as the Delicious games. You have customers and other vets who come in with animals that require products or procedures done. At one point, you get to save the life of a police dog injured in the line of duty, but at the same time, you also get to dye a puppy pink. (Yeah, she's not too happy about it either.) Each level has mini games that range from easy to challenging. You have to complete each mini game quickly before you loose hearts. And if you don't finish it in time, the customer can become very angry. There are 6 chapters with 10 levels each, plus 5 bonus levels for a total of 90 levels. You do have achievements which may, or may not, be easy to obtain. You also get to purchase upgrades for each level as well. 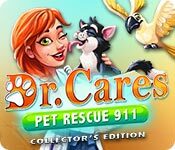 I highly recommend this game for animal lovers, and also for anyone who enjoyed playing the Delicious games as well. This was a great game with a wonderful story and a happy ending. Rated 5 out of 5 by pennmom36 from PAWSITIVELY PURRFECT! Amy Cares has aced her Veterinarian exams, and she's just returned home to surprise her Grandpa Arthur. Grandpa wastes no time putting her to work in his Clinic, but Amy has bigger and better visions for har career choice. Amy confides to her best friend, Lisa, that she plans to return to New York, where her services can help more pets. Her career begins in Arthur's Clinic, then to the city at the Pawsitive Clinic,then to the Critical Care Hospital. As Amy struggles to find her niche, she continues full circle, working at the Animal Shelter, the Horse Stables and eventually, back to her hometown at Grandpar Arthur's Clinic! Dr. Care is adored by everyone, even Emily and baby Paige are fans! I have been a pet lover all my life, which led me to my own career of owning and operating a Grooming Salon, so this game is Pawsitively Purrfect in my opinion! You can play as a Beginner, or Normal and Expert modes of difficulty. Each Clinic has 10 levels, and 5 Challenge levels available. The Challenge levels are optional, but it's the only way to earn Diamonds, which allows you to buy mystery gifts for Newton, the loveable and entertaining Cockatoo mascot. The goal of the game is to serve customers as quickly as possible. Some customers just want to buy a product, others require Veterinary services, as shown in the form of a picture inside a thought bubble, above each customer that enters the shop. Some of those items just require a single click, such as dog food, or treats, other items may require multiple tasks such as clicking on a syringe and then the vaccination, before they can be administered. Some of the tasks require a small and simple mini game, such as clipping each of the pets long nails only, or you may have to click a button rapidly until the pointer reaches the green zone. As you progress, more complex items and tasks are introduced. The faster you are, the better, because customers quickly become less patient. You can use Newton to entertain the pets and people as well, once you have purchased his stand in the upgrades shop. Multi-tasking will earn you extra money, and catching the pop up muse in each level, earns you optional points as well. (in the challenge level, there are several pop up mice to collect while taking care of several customers) You can purchase upgrades with the cash you earn, in the shop. Items such as ew Counters and Vet Tables will make things go faster and keep customers patient, Larger storage bins will hold more inventory, and Decorations keep customers more patient. You can earn up to 3 stars per level, and any level can be re-played to try for a better score. If you liked Happy Clinic, the Delicious series, or like me, are an animal lover, give this game a try, I love it, enjoy! Rated 5 out of 5 by Wolfangels from Great Game !!! This one has "All the Bells & Whistles"... Em's Grew didn't let us down :). Rated 4 out of 5 by Neko6 from Engaging Storyline But . . . All in all, this is a solid addition to the Delicious spinoff universe. The gameplay is enjoyable with just enough challenge to keep it interesting but not frustrating. However, I had two big problems with this game. The first is the graphics were pretty terrible for a Delicious game, especially of the animals. Some of the animals were just downright scary-looking and a few didn't even look like animals at all but stuffed toys. 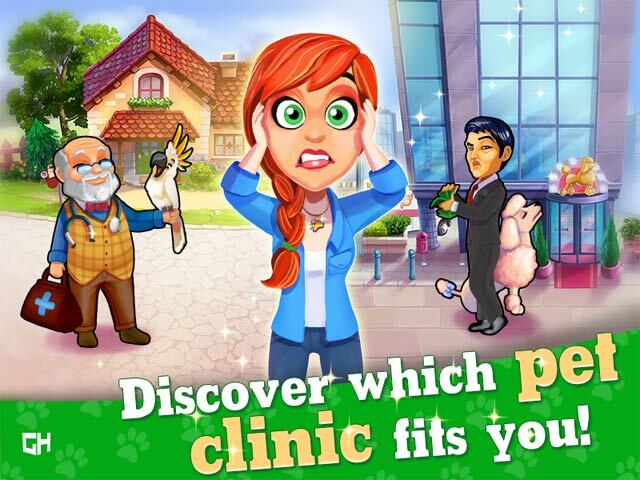 Since this is a game about animals and a veterinarian, I had hoped the animals would look more like, well, animals. 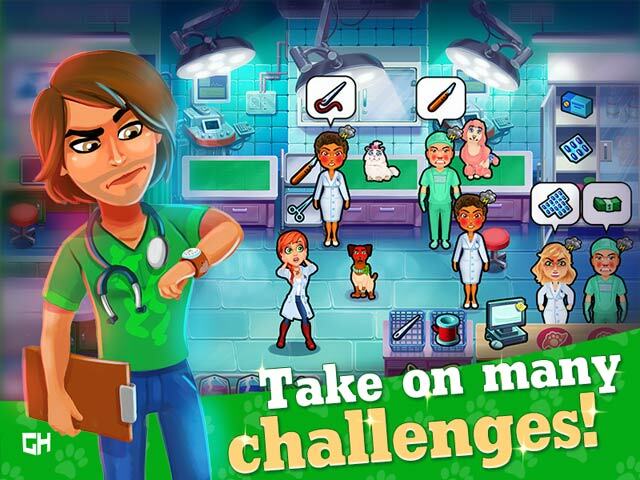 The second problem is this is supposed to be a game about a veterinarian and yet much of the gameplay, while enjoyable, didn't seem very medical/veterinary at all. Much of the game seemed like it was one big glorified pet shop/grooming salon. 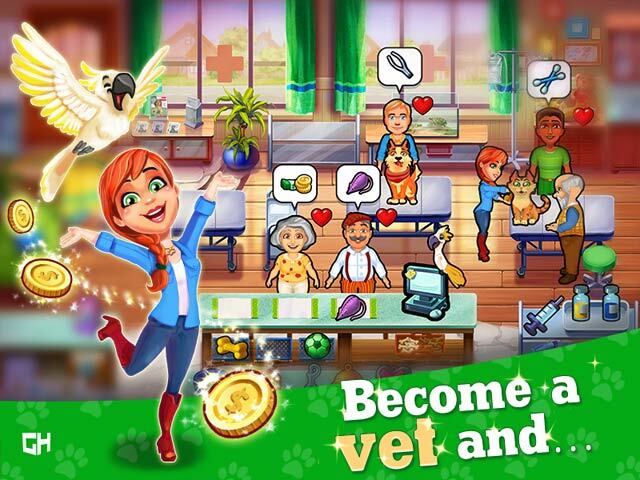 I had hoped for a few more veterinary-like minigames, such as the medical-themed minigames in Heart's Medicine. Instead I found myself selling leashes and pet food most of the time. The biggest draw of this game was the storyline. That's what made me buy the game after the demo ended: I really wanted to know what happened next. I did enjoy this game but I hope the next installment cleans up the graphics and maybe the developers do a little more research about what veterinarians really do. Hint: it's not selling leashes and pet cologne. Rated 4 out of 5 by snowbunny1977 from Cute game Kinda like the Emily games which its the same town just different characters within it which is cool. Fairly easy to figure out and I enjoyed playing it. The story was ok and man Amy sure did make a lot of mistakes and kinda oblivious and naive but I guess considering she is kinda young its trial and error but it annoyed sometimes. I was disappointed Jack didnt play a bigger part in her life especially towards the end. Bummer. Maybe they will do another game sometime.